A little over a week ago several journalists, including myself, received an email from an individual claiming to have been offered money in exchange for falsifying allegations of sexual misconduct against Special Counsel Robert Mueller. “I was contacted via phone call by a man named Bill Christensen, who had a British accent, and said that he would like to ask me a couple of questions about Robert Mueller, whom I worked with when I was a paralegal for Pillsbury, Madison, and Sutro in 1974 (now called Pillsbury Winthrop Shaw Pittman),” the individual claimed. “I asked him who he was working for, and he told me his boss was some sort of politics guy in Washington named Jack Burkman (or Berkman… Not sure how it’s spelled)……. This individual said that they were a female living in Fort Myers, Florida, but she would not speak to any reporters over the phone. Hill Reporter looked into this woman, as did many other journalists we have spoken with, and we all reached the conclusion that this was likely a hoax. No one by the name provided lives in Fort Myers, Florida according to the numerous background checks ran by the staff at Hill Reporter. We also reached out to Pillsbury Winthrop Shaw Pittman LLP who said “we have no record of this individual working for our firm.” They also confirmed that they had no record of the woman’s maiden name, as it was provided to Hill Reporter. We decided to investigate this matter further to see who could be behind the apparent hoax. First, we reached out to a phone number given to us by the mysterious woman. After calling the number, we promptly received back what we viewed as a threatening text message which read, “You’re in over your head…. Drop this.” The message included the home addresses of two of our editors, including myself. Suddenly, we received a phone call from another phone number originating from the same area code. The man on the other end of the line claimed to be Mike Wilcox of a company called ‘Surefire Intelligence.’ Wilcox again issued a threat, telling us to “stop communicating with” the woman who had contacted us previously. Both phone numbers have since been disconnected. 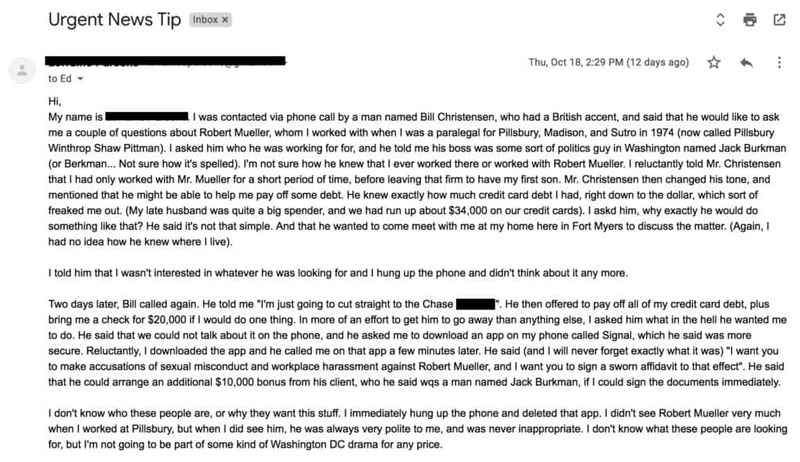 Around the same time as we and other journalists received this questionable email, a Republican lobbyist, radio host, and right-wing conspiracy theorist, Jack Burkman (also mentioned in the questionable email), began promoting, via his Facebook page, that he is investigating sexual misconduct and alcohol-related allegations against Special Counsel Robert Mueller. Between reporting the threatening text message and the phone call to the Special Counsel and discussing the matter with other well-known journalists, Hill Reporter reached out to Jack Burkman. Burkman would not discuss his investigation, other than telling us that he had “one woman ready to go public” and “discussions ongoing with a second [woman].” He then informed us that he is familiar with a company called “Surefire Intelligence” and that a man named Jacob Wohl runs the mysterious intelligence agency. Jacob Wohl, for those of you who are unaware, is a far-right Twitter troll who has had his own run-ins with the law in the past. 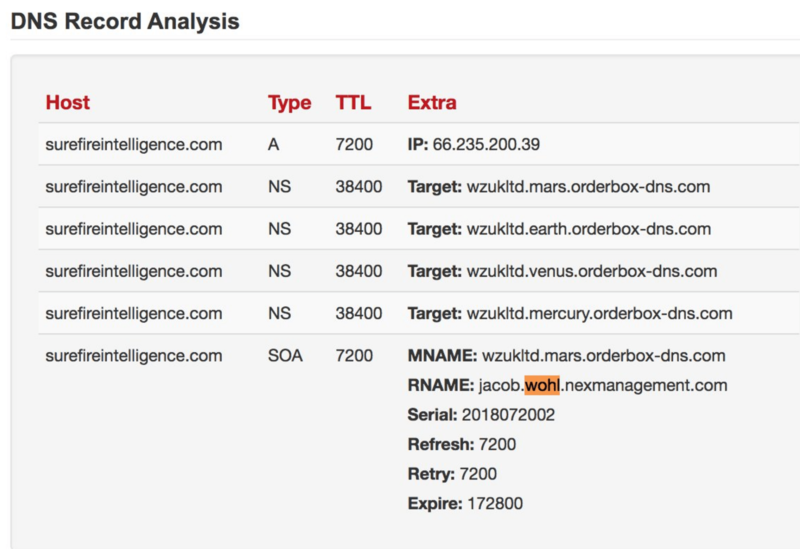 Hill Reporter performed a DNS check on the domain name for Surefire Intelligence, which found that Wohl’s email address was listed on the SOA RNAME: record. We reached out to Wohl for comment, and he denied knowing anything about Surefire Intelligence. Wohl just so happened to make a tweet this morning, apparently advertising the fact that Burkman would soon release details of his Mueller investigation. At first glance, a search for Surefire Intelligence brought up a bunch of question marks. Hill Reporter was unable to locate any business by the name of ‘Surefire Intelligence LLC’ or ‘Surefire Intelligence LTD.’, both names which have been listed on their website, as well as an invoice that Burkman sent us, claiming to have done business with the company. 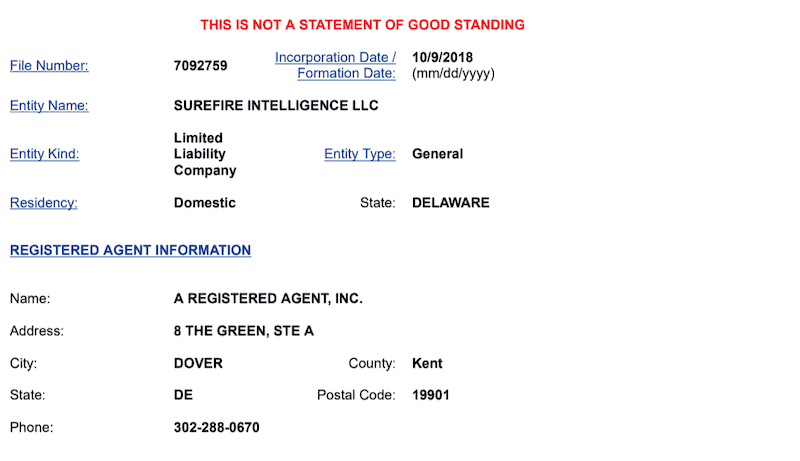 Update: (5:22 PM EST) We received an email noting the company was incorporated on 10/9/2018 in Delaware. File number 7092759. Calls to Surefire Intelligence’s claimed offices returned no answers and it doesn’t appear as though they have any real presence at any of the addresses listed for their multiple office locations throughout the world. The website and company appear to be largely fraudulent, although Jack Burkman claims otherwise. Further investigation into names listed on Surefire’s LinkedIn page has also come up empty, almost as if they were entirely made up. Update: (5:42 PM EST): Twitter user Aric Toler appears to have proven that Surefire Intelligence faked employee accounts, at one point using a photoshopped picture of Christoph Waltz in one of the company’s employee profiles. On the internet, there is virtually no trace of Surefire Intelligence other than their own website, Twitter account and an article written by an author who also doesn’t appear to be real, and whose Twitter account appears to have been created for the sole purpose of promoting the article. After reaching out to Peter Carr, the spokesman for the Special Counsel’s office, Carr told us that they have referred the matter to the FBI for investigation. “When we learned last week of allegations that women were offered money to make false claims about the Special Counsel, we immediately referred the matter to the FBI for investigation,” Carr said. While the players involved — Burkman, a known conspiracy theorist and Wohl, a known Trump supporter and social media troll — certainly make one question what they may be trying to accomplish, there is little doubt that this whole charade is anything but legitimate. Are they trying to garner publicity for Burkman’s radio show? Are they trying to muddy the waters around the #metoo movement? Are they trying to discredit Robert Mueller ahead of the election? The questions are still piling up. 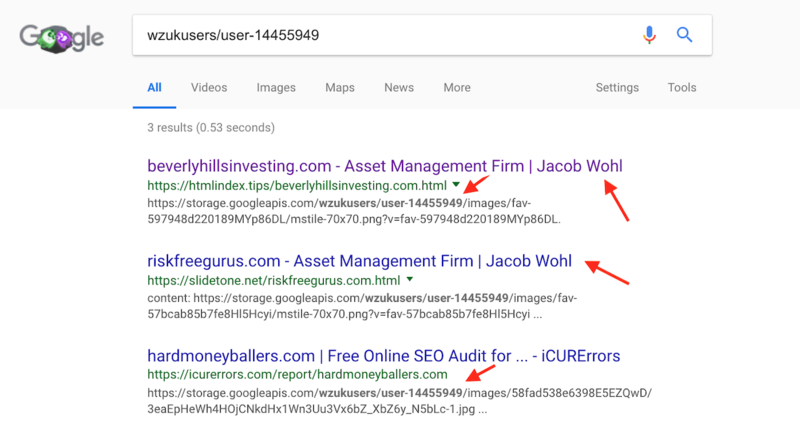 UPDATE (1:42PM ET): Further investigating by Hill Reporter’s Editor-In-Chief, James Kosur, has turned up additional links between Surefire Intelligence and Jacob Wohl. While Wohl claims to have no knowledge of Surefire Intelligence, source code on the website itself directly links Wohl to Surefire Intelligence. Screenshot of page source for SurefireIntelligence.com. UPDATE (5:06 PM EST): New Yorker Staff Writer and “Dark Money” author Jane Mayer shared a tweet of the Surefire Intelligence’s Managing Partner and it’s an exact match (although darkened for effect) to one of Jacob Wohl’s own publicly available photos. Below you will find the letter received on October 18 by Hill Reporter and several other well-known journalists, as well as an invoice sent to us by Burkman. 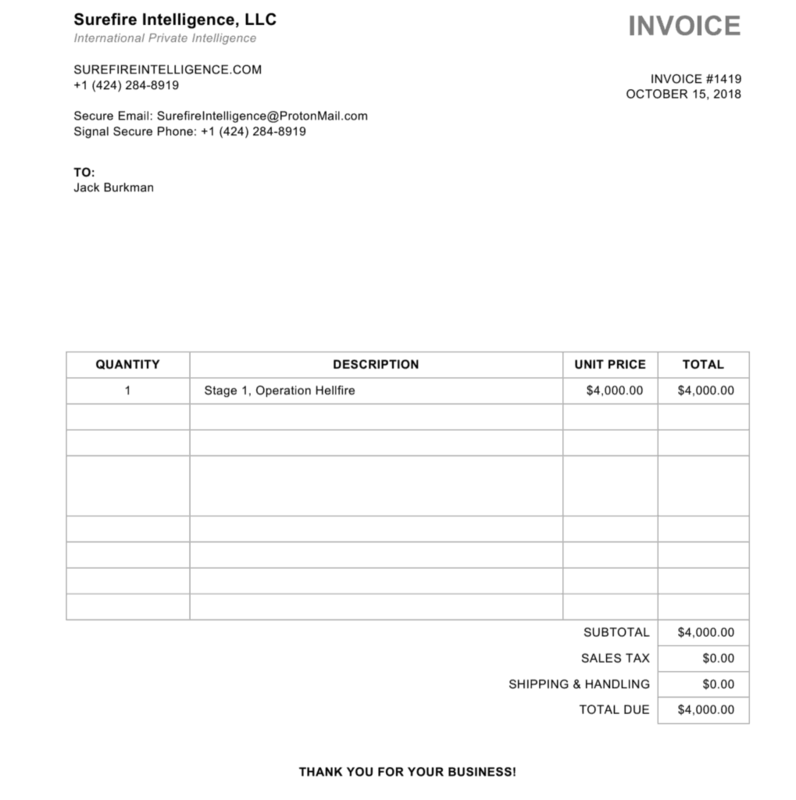 Alleged Invoice sent to Hill Reporter by Jack Burkman. UPDATE (4:48PM ET): After we broke this story early Tuesday morning, further details continued to surface. The most recent update suggests that a woman named Jennifer Taub, an associate professor at Vermont Law School also received an email. Taub told The Atlantic’s Natasha Bertrand that she had never had any encounters with Robert Mueller. Update (5:54 PM EST): The Washington Post On Tuesday, August 3, 2010, noted that on Monday, August 2, 2010, Robert Mueller was serving jury duty in D.C. Superior Court. The intelligence report posted by Jacob Wohl on the website Gateway Pundit, and provided by an unknown firm that goes by the name “International Private Intelligence” claims Mueller raped a woman in NYC “on or about” the same day he was serving jury duty in Washington. D.C.